I Forgot My Password! Now What? 1. If you know your Home Access Center account information, you can look it up there under "additional student information." Parents/guardians can also look up this information inside of their Home Access accounts. 2. 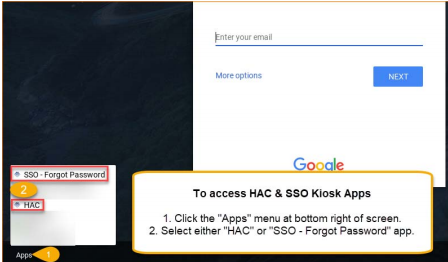 You can use the "SSO Forgot Password" kiosk on your Chromebook (see image below). You will need to answer your security questions before being prompted to create a new password***. 3. If neither of these options is working for you, the house secretary will need to reset your password for you. Use the SSO-Forgot Password Kiosk on the home screen of your Chromebook under the "apps" menu to retrieve a forgotten password. I Don't Like My Password. Can I Change it? You are able to change your password as long as it meets the minimum security requirements. Check out this PDF for step by step instructions. Why Are Some Web Pages Blocked? For the protection of our students, the district has installed a LightSpeed Internet Filter on all Chromebooks. This filter is applied to your browsing whether you are at home or at school. Occasionally, you may get 'kicked out' of the web filter. * If you are not logged into the filter, you will be prompted to do so on a blue and black screen. * If the public site loads properly, you are logged into the filter and may just be encountering a website that is blocked. * If you are being blocked from a site that you believe has educational value, you may request to have it unblocked by having a conversation with the school librarian and/or school tech team. What Do I Do If Something Is Broken or Not Working? Any malfunctioning Chromebooks should be brought directly to the school LMC. The librarian will issue you a replacement device while we fix yours. DO NOT take your Chromebook to a third party (such as Best Buy) for repairs. Repairs done by third parties will void all warranties on the device and may end up costing you more money in the long run. Can I Buy a Case/Cover for my Chromebook?